Sprouted brown rice onigiri made with five grains. These onigiri were made using brown rice, black rice, soybeans, rolled barley, and sticky millet. Each package is 320g, contains 4 onigiri total, and arrives frozen. Onigiri, or rice balls, are one of the most popular snack foods in Japan; and are sold at train stations, convenience stores, and supermarkets all over the country. There are countless types of onigiri, made with all different sorts of rice varieties and other grains. These onigiri were made using brown rice, black rice, soybeans, rolled barley, and sticky millet. For our sprouted brown rice, we used a low-amylase rice (a type of rice related to ordinary Japanese rice (Uruchimai) and glutinous Japanese rice (Mochigome)) called Iwata 15 Gou. 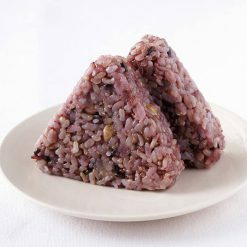 Iwata 15 Gou does not have the characteristic scent sometimes associated with sprouted brown rice, and has been prepared in a way that is quite easy to eat. 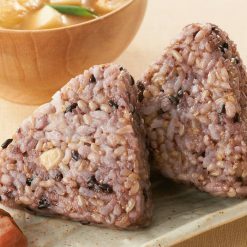 This product contains rice (brown rice, polished rice), black rice, soybeans, barley (rolled barley), sticky millet, table salt.